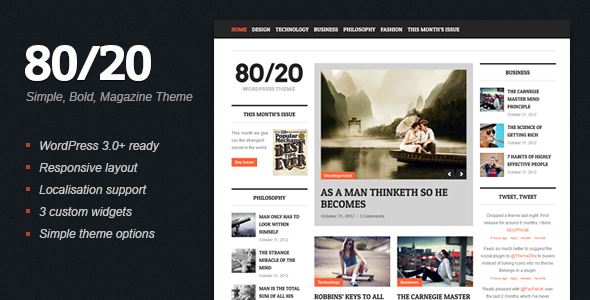 Eighty Twenty is a WordPress magazine / news / community theme for both print and digital publications. Eighty Twenty uses a bold, clear, and organized layout as well as strong and simple visual elements. All together creating absolutely minimal fluff and fuss – just a smart and simple window for your post content. The theme options are refreshingly very lite and easy, freeing you from feature-bloat and unnecessary learning curves that get in the way of you and your content. Just install the theme and get going. Eighty Twenty makes the most of the WordPress sticky-post functionality, so it’s a breeze for you to organize your homepage featured posts and avoid duplicates. Thank you very much, your help with the support ticket was very instructive and good. I love this theme, everything just works first time and it’s super clean! Our client is very happy with this theme, when support is needed it is fast and helpful, deserves more than 5 stars. Thx for this great theme! I am still flashed by the great layout and the easy set up.